United Nations-backed talks to reunify the Mediterranean country fell through early Friday morning. United Nations-backed talks to reunify Cyprus have fallen through. Cyprus is an island in the Mediterranean. It's been divided between the Greek Cypriots and the Turkish Cypriots since 1974. That's when the Greek Cypriot military staged a coup, attempting to unify Cyprus with Greece. Shortly after, Turkish troops invaded the northern part of the island. The southern part of Cyprus belonging to the Greek Cypriots is internationally recognized and a member of the European Union. The north is dominated by the Turkish Cypriots and is only recognized by Turkey as a nation. U.N. Secretary-General António Guterres flew to the Swiss Alps to discuss the situation with Greek Cypriot President Nicos Anastasiades and the leader of the Turkish Cypriots, Mustafa Akinci. But the negotiations hit a standstill for a couple of reasons. 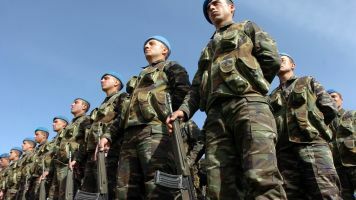 Greek Cypriots wanted Turkey to withdraw the estimated 30,000 troops stationed in the northern part of the island. But Turkish President Recep Tayyip Erdogan was not willing to accept those terms. Another thing holding back negotiations was that the Greek Cypriots wanted the town of Morphou back for their displaced citizens, but Turkey only offered up a part of the town. Turkey also made demands for a rotating presidency in the negotiations, something the Greek Cypriots were willing to talk about. Despite the disappointing result to negotiations, Cyprus government spokesman Nikos Christodoulides remained optimistic, saying these talks are not "the end of the road."